A typical Korean street snack. The chewy and spicy goodness will leave you feeling warm inside! Ddeokbokki, or Tteokbokki (떡볶이) is another very popular street food snack. It is made primarily from soft chewy rice cakes, fish cakes and seasoned with a sweet red chilli sauce. You will find it typically being sold by street vendors but as it takes no time at all to cook what excuse is there to not give this a go at home? I have fond memories of ddeokbokki as this was the first street food ever I ate in Korea. I remember clearly the orange street food tent at the side of the road in Suwon as I walked around on that bitterly cold winters evening. Sitting down there eating my ddeokbokki amongst other people with the steam from the cooking area drifting around I forgot all about the cold weather 🙂 It was a perfect snack to give me the fuel and warmth I needed then. It was also a great introduction to Korean street food! As with all ingredients within my recipes, if you’re not sure what something is – or where you can find it – just click on its name in the ingredient list on the left to find out more! If you're using frozen rice cakes and fish cakes then pop them into a bowl and cover with cold water. Set aside while you prepare the rest of the ingredients. Hard boil both eggs in a pan of boiling water for approximately 10 minutes. Slice the onion and spring onion. Put 600ml of water in a pan and bring to the boil. Meanwhile mix the remaining sauce ingredients together in a small bowl. Once the water is boiling stir the sauce mixture into the pan and bring back to the boil. Remove the rice and fish cakes from the bowl of cold water. If you're using the larger sheets of fish cake (shown in this recipe) then first cut them into strips before adding them to the pan along with the rice cakes and sliced onion. Cook over a medium heat for 5 minutes. Remove the shells from both hard boiled eggs and slice each egg in half. Add to the pan and reduce the heat to low for a further 5 to 10 minutes to allow the sauce to thicken. Stir frequently. Transfer to a serving dish, garnish with the sliced spring onion and enjoy! 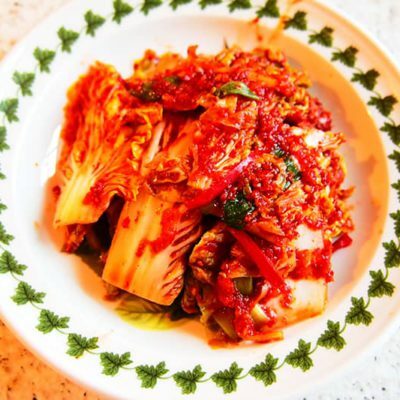 Passionate about cooking, eating and promoting Korean food in the UK.